The team at McLuhan House, an Arts Habitat project, is thrilled our studio residency artist, Lauren Crazybull, is the recipient of the new Artist in Residence program launched by the Alberta Government. Minister of Culture and Tourism, Ricardo Miranda presented the first ever grant for the program to Lauren at McLuhan House. “Lauren’s authenticity and her obvious passion are refreshing. 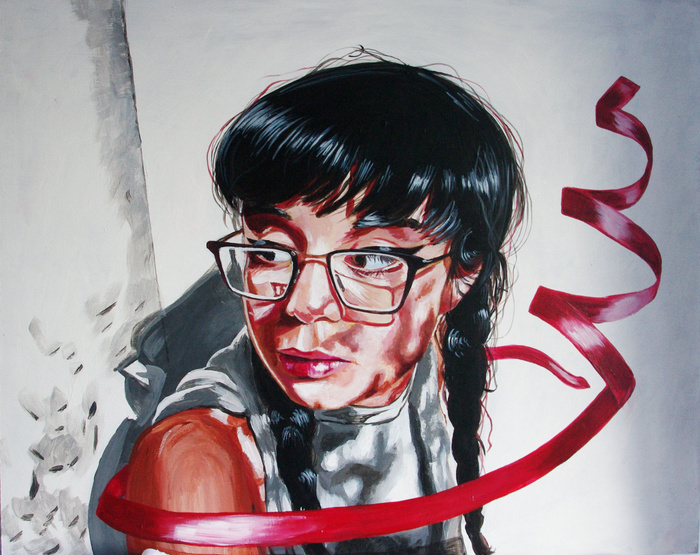 Her art challenges stereotypes and celebrates humanity. I have no doubt she will be successful in her role as the first Artist in Residence in Alberta,” said Minister Miranda. Lauren strives to create honest personal expressions that reflect deep humanity, and a genuine willingness to connect empathetically with her audience. For the past year Lauren has worked out of space provided by Arts Habitat. “Being given space changed things in a big way for me. This studio residency gave me the opportunity to pursue my practice seriously and to experiment with larger scale work. It’s really pushed my practice in a good direction,” Lauren noted. Lauren acknowledged the one year stay at McLuhan House allowed her to focus on her art and not the expense of a space to work in. Arts Habitat believes that more artists could benefit from space that is affordable, appropriate, and sustainable in which to create. “The McLuhan House Studio Residency program is one small answer to a much larger problem.” said Executive Director of Artists Quarters, Julian Mayne. 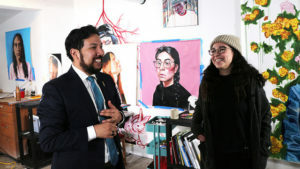 Since 2011 Arts Habitat, in partnership with Artist Urban Village, has been working to make Artists Quarters, a 15-story building that includes home and studio space for artists and two floors of retail or rental space a reality in the Quarters downtown Edmonton. Once built, Artists Quarters will help artists like Lauren find affordable and sustainable workspaces and answer the proven need for affordable housing options for low-income professional artists. 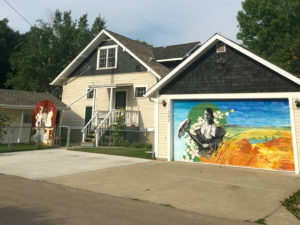 Arts Habitat appreciates the leadership shown by The City of Edmonton in their commitment to Artists Quarters through a contribution of $8.3 million, including the donation of land. Arts Habitat is currently in the process of securing funding from the federal and provincial governments. Lauren describes her art as a way to connect with the subjects she paints and allows space for her to reflect on personal, social, political and spiritual beliefs. She has spent years mentoring youth and understands that her creative power is a poignant way to advocate in diverse and subtle ways for the intellectual, spiritual, visionary, and political courage of Indigenous people.